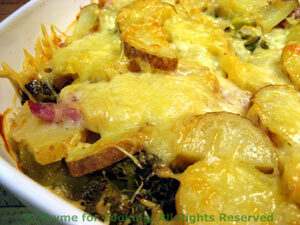 Potato, Ham and Broccoli Gratin, quick, easy dinner recipes. Scalloped potatoes, a bit of onion, some ham and broccoli, and you have a complete dinner from the oven with very little work. You could bake it for 90 minutes at 350F (175C) if you like.